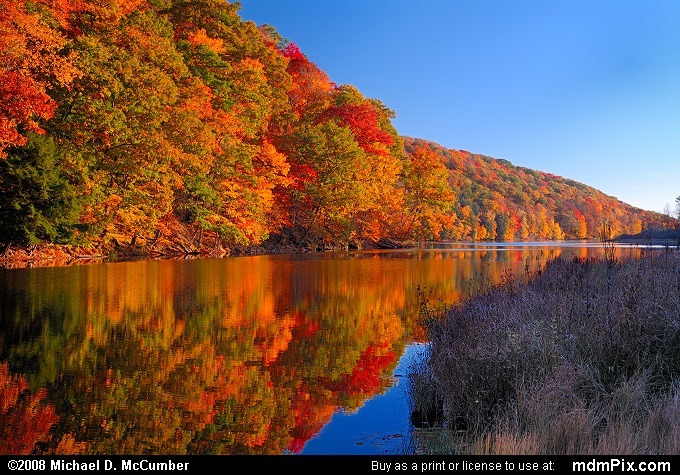 The calm waters of Lake Trent, or Laurel Hill Lake as it is known today, played the part of a mirror for a beautify bounty of rich fall foliage brought alive by the warm light of an evening sun in Laurel Hill State Park in western Somerset County, Pennsylvania. In shadow are some wetland vegetation with a purplish hue to offset the bright colors of the lake and trees. 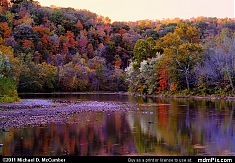 The autumn of 2007 brought color to seemingly every tree at once in Pennsylvania's Laurel Highlands leaving time the only challenge to capturing some fantastic scenery. A heavy rain and wind storm blew though the area early the next day, thus this was the last possible picture of brilliant autumn color for the year.